E00768. 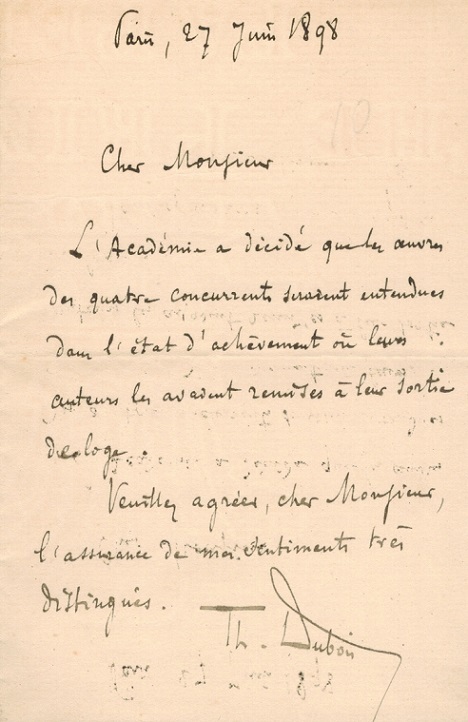 Dubois, Théodore - signed note, Paris June 27, 1898, 4x6. “Théodore Dubois studied first under Louis Fanart (the choirmaster at Reims cathedral) and later at the Paris Conservatoire under Ambroise Thomas. He won the Prix de Rome in 1861. In 1868, he became choirmaster at the Church of the Madeleine, and in 1871 took over from César Franck as choirmaster at the Basilica of Sainte-Clotilde. In 1877, Dubois returned to the Church of the Madeleine, succeeding Camille Saint-Saëns as organist there. From 1871 he taught at the Paris Conservatoire, where his pupils included Pierre de Bréville, Guillaume Couture, Gabrielle Ferrari, Gustave Doret, Paul Dukas, Achille Fortier, Xavier Leroux, Albéric Magnard, Édouard Risler, Guy Ropartz, Spyridon Samaras, and Florent Schmitt.